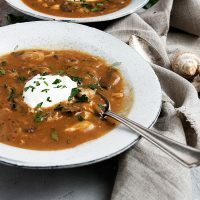 An easy and delicious soup, filled with mushrooms and chicken, in a paprika flavoured soup. If starting with an uncooked chicken breast: In a large soup pot, heat a bit of cooking oil over medium heat, add diced chicken and cook, stirring, until just cooked through. Remove to a bowl and set aside. Heat a bit more oil in pan. Add diced onion and cook over medium heat, stirring, just until softened. Add mushrooms and a pinch of salt. Cook, stirring regularly, until mushrooms are softened. Add chicken broth, paprika and dill. Add cooked chicken back to the pot. Bring to a boil, then reduce heat to medium-low and allow to simmer for about 10 minutes to allow the flavours to develop. Taste soup and season with salt and pepper, as needed. Stir in chopped parsley. In a small bowl, stir together the cream and cornstarch. Add about 1/2 the mixture to the soup and cook, stirring, for 1 minute to thicken. Add more of the cream mixture to the soup as needed, until soup is thickened to your liking. Spoon soup into serving bowls. Top with a dollop of sour cream and additional chopped fresh parsley.